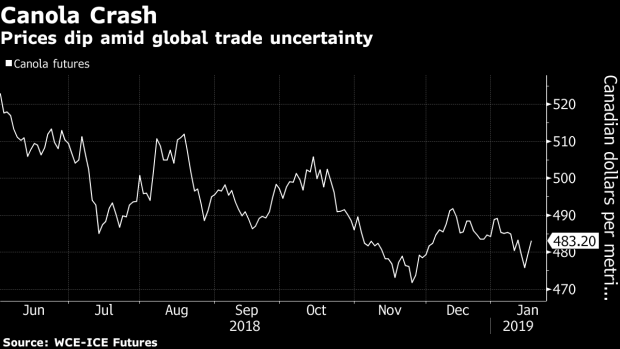 A slump in oilseed prices as a result of Donald Trump’s trade war with China isn’t phasing Canadian farmers, who may plant the most canola acres ever amid the global spat. 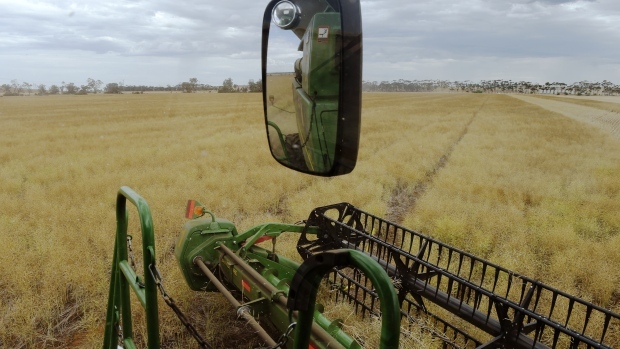 Canola sowing probably will rise 5 per cent to a record 24 million acres in 2019, according to Tony Tryhuk, the branch manager of RBC Dominion Securities office in Winnipeg, Manitoba. Canola is still the go-to cash crop for farmers despite bearish influences from the U.S.-China trade war and the fact that Canadian shipments haven’t grabbed a bigger slice of the global market as the two nations feud, he said. The shift to higher acres comes as prices of canola -- used in everything from salad dressings to deep-frying -- have tumbled alongside soybeans as demand for U.S. supplies withered in the second half of last year amid an escalating trade dispute with China. Futures are down about 8 per cent since June, while cash prices in parts of Saskatchewan are at $10.34 a bushel, according to data from Farmers Advanced Risk Management Co.
Canada had hoped to boost shipments to China as the Asian nation shunned American oilseeds, though export demand has trailed some analyst’s expectations, Tryhuk said. Canada shipped 4.6 million tons of canola between August and Jan. 13, down about 9 per cent from a year earlier, Canadian Grain Commission data show. Cheaper soybeans have softened demand for canola exports to regular customers such as Mexico, he said. “We have a bearish situation fundamentally here in canola,” said Jerry Klassen, who manages Canadian operations for Swiss trader Gap SA Grains & Produits in Winnipeg. He expects acres to remain relatively flat in 2019. Sales to China have slowed and “whether that’s going to change in the future it’s really hard to say,” Klassen said. Part of the oilseed’s enduring allure is the fact that canola returns are still better than many other crops which have seen prices and export markets stymied by trade barriers, Hall said. Canadian durum prices tumbled after Italy implemented country-of-origin regulations on pasta while pulse prices have declined from records following increased global output and import tariffs levied by India. Canola acres probably will rise despite the uncertainty in the oilseed market and the “unprecedented” soybean carryout that’s looming in the U.S., said Neil Townsend, a senior analyst at FarmLink in Winnipeg. Canadian farmers don’t have that many oilseed options to include in their rotations, though a potential recovery in the pea and lentil market could emerge as an alternative to canola, he said.